A month ago, as I was zipping through the streets of Ho Chi Minh City on the back of a motorbike, I noticed the transit habits of the locals. There’s not many cars, it’s mainly motorbikes. That’s a transition in itself: when I first visited in 1990 it was mainly bicycles. You don’t see a heap of them now. What interested me was the number of occupants per motorbike. Probably about half had just the one person, but a huge number had two or more. Several I saw (but wasn’t quick enough to photograph) had dad, mum, two kids and a dog. 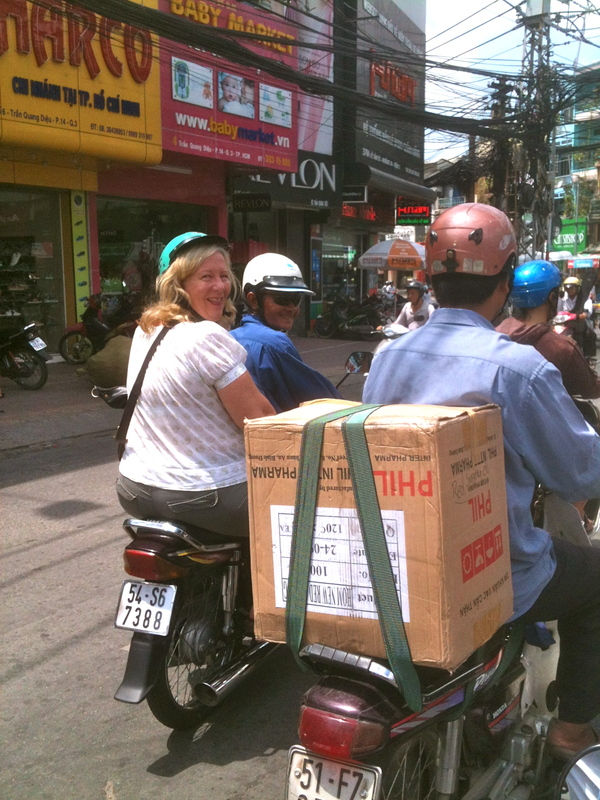 On a motorbike, that’s high occupancy. To see that here the average occupancy of a motorbike outstripped the average occupancy of a car back in Australia got me thinking. It’s not worth getting annoyed (again) at our tendency to unnecessarily pump our air with pollution so that we can jam our roads with single occupant cars, it’s better to spend my energy trying to understand why. Why, when in other countries people move about on a fraction of the fuel, without seeming to be any less happy than we are. I figure it’s an issue of relativity. Yes, I have some theories about this, and yes, as a long-retired rocket scientist, the pun is intended. No doubt a big part of this is about economics. A litre of fuel in Vietnam is a vastly higher percentage of a local salary than in Australia. But it’s also about space. We make massive roads in Australia to make motorists feel more comfortable about driving something ten times their size. In Vietnam, a car looks big and cumbersome on those narrow streets. It’s all relative. Obviously there is more risk throwing the family on the back of a motorbike, but acceptance of risk is relative too. These guys have had a massive war in their not-too-distant past. They crawled through tiny tunnels (and following my visit I can now personally attest to how scary that must have been) to get to the Saigon River, from where they would sneak into the city during the night to carry out raids on American soldiers. Those kinds of experiences must make the risk of four people on a motorbike seem positively piddly. It has become apparent to me that I must be attracted to war zones, as I am now in Croatia, which itself was in a bloody war in 1992. And my relativity theory seems to hold here, too. People are vastly more relaxed about risk than back in Aus. Seatbelts are little more than an option on the roads, people hop on and off boats by leaping across open water, kids play waterpolo unsupervised wherever there is a few metres of open coastline. I actually think it’s great. It feels like people are forced to understand risk and take responsible decisions from a young age. They are being less influenced by a fear-loving media and more by intuiitive mathematics. For example, there is no such thing as a ‘drinking age’ and alcohol is available in supermarkets. 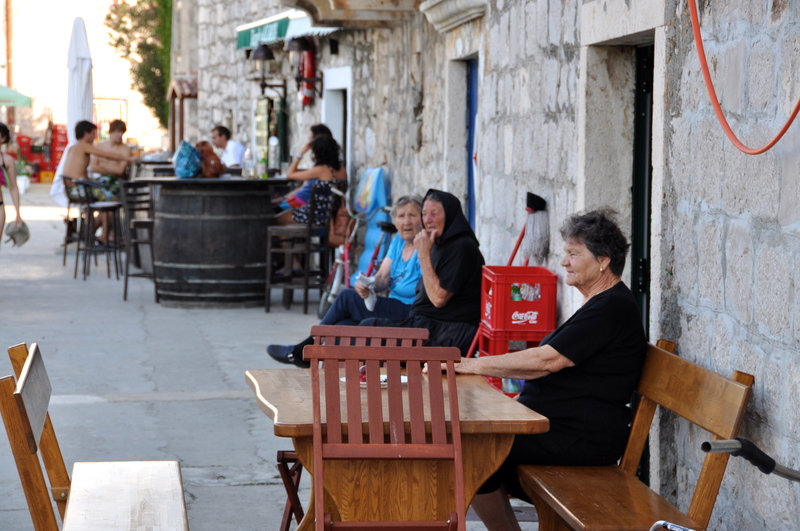 Despite this freedom, or perhaps because of it, there is (with the exception of the drunk Santa we saw in Zadar) no visible alcoholism or homelessness. Perhaps our seemingly advantageous position on the scale of relativity actually sees us worse off in a whole range of ways. It is all the rage at the moment to talk about our ‘First World Problems’, you know, the gym closing an hour early or the supermarket running out of Your Brand of cranberry juice. What we are really saying is, jeez, isn’t it brilliant that our life is so good that this is the worst we have to worry about. But you know what? In the ‘Other World’ I see people prepared to do more things in their lives. Kids play in the street, and people have festivals without taking out liability insurance. There is less TV and Xbox and more community. There is also less obesity and diseases of affluence. But overall, there is just more Life. And I absolutely love it. Affluence. I think we need to be careful what we wish for. And as the world continues its unstoppable march ‘forward’, perhaps we can share some worldly advice with the countries where change is most rapid as they ‘catch up’. Look before you leap, as it’s not necessarily better on the other side. You might get cable, but you might lose a whole lot more.